Finding a quiet window mounted air conditioner can be a challenge. Mainly since the noisy components, the compressor and fan, are located directly inside the packaged unit. Since the compressor is located in the unit and not outside away from the home some degree of noise will always be present. With that said there are some window air conditioners that have less noisy compressors than others. The best way to judge how noisy a window air conditioners will be, is to read real reviews from real people online. Keep in mind to get a truly quiet unit there are other ways that are affordable such as mini split systems which separate the compressor outside and then feed lines into a home that circulates refrigerant to a blower motor. Split systems require more effort and skill to set up but are not as expensive as traditional central air conditioning systems used in homes. Here are the top units we have found that make the least amount of noise. 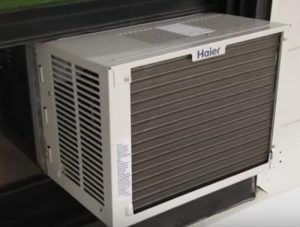 Haier is known for making quiet heating and cooling units. This unit is a 6000 BTU, 115 Volt unit and uses what is called Cross Flow technology to keep the fan noise level down. The Haier company also wraps the compressor in a noise suppressant blanket that quiets it down. The compressor on any HVAC unit often makes the most noise and can be heard kicking on and off as it cycles. Having this component wrapped goes a long way in making a unit run quieter. The cross flow fan technology also makes the fan run smother and make less noise than conventional fans. A window unit will always make some noise but this may be the quietest unit available currently. Emerson has a new window A/C unit called the Quiet Kool EARC6RE1. It is built for easy installation, LED display, three speeds and a remote control. Emerson is a well known company with good warranties including 1 year parts and labor, 2 years parts and 5 years on the compressor. 6, 000 BTU is rated to cool a room from 150 to 250 square feet. LG makes many good window A/C units including the 8,000 BTU LW8016ER. While it may not be the quietest on our list when mounted correctly it operates much quieter when compared to many other units. One of the things that make it have less noise is it has a rotary compressor which is quieter and more economical to operate. It is 115 Volt unit that is rated to cool 340 square feet of space. When it comes to price, along with a well built unit that is much quieter when compared to many other models the LG LW8016ER is worth a look. Friedrich Chill also makes many good units including the model CP06G10B. It comes with a nice remote control that makes it easy to change the setting from a distance. The unit has 3 cooling speeds, 3 fan speeds, auto-cool, energy saver mode and programmable 24-hour on/off timer. The 6,000 BTU unit is rated to cool a space roughly 250 square feet depending how hot it is, and how well insulated the room is. When set to high cooling it does make noise and works best at lower settings for a more quieter unit. While not the quietest when comparing price vs. overall build, it may be a good option for a budget minded person looking for a good unit. The Frigidaire FFRE2533S2 is also a quiet A/C unit. One of the reasons why is its a 220 Volt unit which allows the compressor to run more efficiently. 220 Volts is not common in every room and are mainly used for a electric dryers and electric water heaters. Running a 220 Volt outlet to a room is not difficult but if this is a problem than it will be better to look at other units that use the standard 115 Volts. The Keystone Window Air Conditioner unit is a 5000 BTU, 115 Volt unit. It has a three speed fan which can be turned to low for the quietest setting. It has a rated indoor noise Level of High at 55 dBA, Medium 52 dBA, and Low at 49 dBA. One of the reasons it is quieter is its a smaller unit able to cool a space up-to 150 square feet. The small size and package gives it a lower cost but also less cooling power that may be needed in a large room. While this A/C unit may not be the quietest on the list it is a popular window A/C package that makes less noise than many others. Window A/C units are not usually built to be the quietest since they are budget oriented equipment meant to fill a gap in a cooling system. Doing basic maintenance on a unit can go a long way in helping it stay running the best it possibly can. Basic care can also improve the life span of a unit which normally is up-to five years. Things such as cleaning the air filter and keeping the outside air fins clean of debris can also make a unit run more smoother. How well a unit is installed can also make a impact on noise level. Read here for some tips on how to help quiet down a noisy window air conditioning unit. One of things I always recommend is looking at a mini split system since they are very quiet, low-cost to operate, and built to last. Mini split systems are basically the same as a big home unit only on a smaller scale. They are very quite and about as close to silent an HVAC system can be. They are also perfect for the DIY type of person with many DIY kits available. Of course they do require more skill to setup and require some basic construction skills such as using power tools and wiring. The way a unit is mounted and installed can make a big deference in noise levels. Be sure the package is level and has sturdy mounting brackets. Also cheap foam insulation on the side and top of the unit can do wonders. After reading numerous reviews I decided on the Haier Serenity Series an haven’t been disappointed. I saw a episode on PBS this Old House about the units and made the dive. The picture they have in their ad with the baby sleeping next to the AC unit is a bit exaggerated but it is the quietest unit I have ever used. If you need a quiet window air conditioning unit than do yourself a favor and get a Haier. 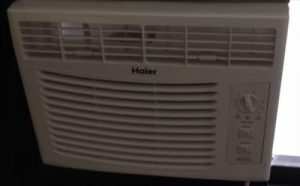 LG also makes reasonable low noise units which I use in other rooms, for the main living area though I use a Haier, best decision I ever made. I have a question. Is it better to get an oversized unit that can keep up with demand on low or to get a smaller unit that would need to be ran on high more of the time. Specifically in regards to noise level. Im also interested in this question. Hope someone has an answer. Hi, I’ve found the internet links which give you the calculations for the room have always worked for me. I googled “what size window AC do I need?” because I have a living room open to the kitchen and wanted to make sure everything stayed cool. I learned you have to add 4,000 BTU onto the recommended size just for the kitchen! So, it’s been helpful and has worked for me. I’m currently shopping for the bedroom and I read if two people usually use the room you add 600 BTU for each person. So these are things we don’t think of. Recommendations will give you a BTU range so I would stick with that and use your judgement but I wouldn’t go over the recommended range for the particular room you are cooling. Instead, try setting your AC on 72-73 degrees at the beginning of the hot season and just forget it! Turning the unit on and off uses more electricity than you realize. Trust me, I was skeptical but I tried it for one month and have never looked back. I leave mine on Energy Saver mode and come home to what feels like central air. Stay Cool! I bought and installed a Haier Serenity Unit and it is really quiet compared to my old Koldfront unit even on high. My only complaint would be it sticks out into the room more, about 5 inches. Otherwise great unit. I have the LG 8,000 BTUs – it’s loud. Bought a Friedrich’s 14,000 and it is significantly quieter. I always stay away from Frigidaire. Are you saying that Frigidaire a/c’s are loud or generally lacking in quality ?